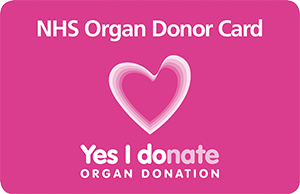 It is essential to let your family know that you have made the decision to donate your organs and/or tissue when you die. If donation is possible we will talk to your family about the fact that you had registered as a donor, check that they don’t have any more recent information about your decision and ask them to support the decision you made. They won’t know what you want unless you tell them, so don’t let it be a surprise. Help them to support your decision at a difficult time by talking to them about it now. We send an organ donor card to everybody who registers for the first time.